We gave this to our son for his 16th birthday (with new car keys attached of course) He plays on the High School Golf team, so this made a perfect embellishment to the new car. I didn't give it a perfect score because it's a bit heavy for my taste, but I know it will be a charished keepsake to commemorate this special time in his life. A great gift for golfers! This was a great product for our groomsmen who love golf. I wanted to get them something they would actually use and this definitely served the purpose! I am giving this monogramed golf tool to my groomsmen. Everyone that I have told about it have given me a thumbs up. This is just what the best man needed from my understanding- he isn;t the best golfer ( is what my new husband says anyway) - I loved it because we could perzonlize it for him. Q:How do you get the ball marker out of the key ring? We purchased these for our groomsmen and cannot get the ball marker out of the divot tool. The magnet are too strong and we just need to know if there is a trick to get it out. A:Since the strong magnets hold the pieces tightly together we recommend that you angle it along a table, desk, and use force to separate the pieces. Or maybe getting a thin sturdy piece to try and pop the pieces apart. 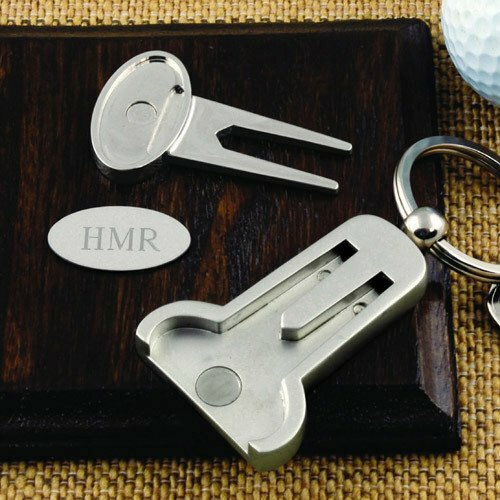 This multi-functional golf key ring is a divot tool and ball marker in one. Conveniently attached to a key ring, it's the perfect companion for an avid golfer. Whether attached to keys, or just securely attached to a golf bag, this stylish tool will surely come in handy. This item is engraved with up to 3 block initials for the perfect groomsmen gift, best man gift or corporate gift. Each 3-piece set comes with a key ring, divot tool and ball marker that fit together via strong magnets to form one compact tool. Measures 3.75" in length. Pair with an embroidered golf towel for an extra thoughtful gift.